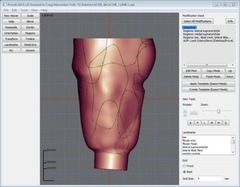 ProvelCAD is a new modern prosthetics CAD package. Currently we focus on AK and BK sockets, but other uses may be practical as well. ProvelCAD was designed from the beginning to offer powerful template features: any modification can be part of a template, and templates can easily be created from any model. Modern 3d graphics technology is used for fast and responsive live previewing of modifications as you edit them. 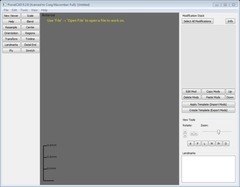 The Modification Stack system allows modifications of any type to be applied in any order, and any number of times, and edited at any point. ProvelCAD is designed to let you get your work done quickly, and let you reuse your work through templates easily. ProvelCAD supports both importing and exporting AOP, OBJ and STL files, and can be used to convert between these file types. ProvelCAD is currently in beta. This means all the required features work and it can be used, however we want additional testing and feedback. Please give it a try and su.levorp|ofni#wonk su tel if you have any issues or suggestions! Everything you need to get started trying ProvelCAD is currently available for free on this page. To see if ProvelCAD runs on your system, we recommend downloading and installing a trial. Then you can test that it works as desired before purchasing. Licenses are not locked to a single OS or machine. A single license will work on Windows, as well as any other supported operating systems though you are only permitted to use one computer at a time with a single license. Licenses do not expire, and do not require online activation. Windows XP, Vista, 7 and 8 are supported. Windows 7 or newer with at least 2 GB of RAM is recommended best performance, but is not required. Mac OSX 10.6 - 10.8 and 10.10 are supported. At least some versions of OSX 10.9 (Mavericks) do not currently work. Older versions of Mac OSX may work, but have not been tested: download the trial and see if it works for you. This version has some known issues: read the included "readme.txt" for instructions on how to work around them. You will need a license file to run it. A Linux version may be made available is there is sufficient interest. For the actual software download, see the section for your operating system above. Free beta tester license: You will need a license to run ProvelCAD; this license allows unrestricted use until December 31th 2014. We will issue extended trial licences upon request. Here is a zipped version of the same license (Unzip before using). This might be useful if you have issues saving the non-zipped one. See the section for your operating system above for installation procedures, and additional notes. Once installed, launch ProvelCAD. You may get a notice regarding your license; if so, see the license download above and the related license documentation. Once licensed, you can access the in application help via the "Help" menu, and either view it in the ProvelCAD's help viewer, or your web browser, which ever you prefer. There is also a copy of the exact same help documentation online, but it is recommended you access is from inside ProvelCAD since that guarantees you have the version that matches what you are running, and it works without an internet connection. Fix loading of ASCII STL files. Clarified height label in cross sections view (and added total height value). Made Mac version export AOPs and OBJs that should exactly match the windows version and may improve compatibility. Clarified an error message and spelling fixes.